Here's looking at some of the high points in the ceremony! They came, they saw and they loved 12 Years A Slave. (Leonardo DiCaprio, not as much). The Academy’s given its verdict and the show’s over. And yet what would an Oscar telecast be without little bits that stick amusingly/annoyingly/persistently/thought-provokingly in the head? Five-time Oscar nominee Amy Adams walked out with the ever-incredible Bill Murray to present the award for Best Cinematographer. It was a clearly unscripted moment, and Adams, shocked at first, applauded strongly, as did the audience, even as Murray gave poignantly silent pause before apologising to the Academy and finally announcing the winner. It was a moment of absurd, delightful lunacy, the kind Ramis as one of the cleverest jokesters of would have loved. There were a fair few musical performances during the Academy Awards this year, and while Pharell got some applause for getting the nominees to shimmy with him as he sang Happy from Despicable Me 2, the loveliest moment of the night came when Karen O, joined by Ezra Koenig of Vampire Weekend, performed The Moon Song from Her. A nominee for Best Original Song, the track is a soulful, achingly pretty one and Karen sings it with amazing fragility. With the house lights turned way down and a big blue moon looming in the background behind Karen in a scarlet dress (and Ezra in matching socks) it was a moment of soft, beautiful clarity in an otherwise over-cluttered ceremony. However, much to Cumberbatch’s possible chagrin, Oscar host Ellen DeGeneres might have unwittingly played Moriarty and thwarted his plans by tweeting — live from the show — what would soon become the most-retweeted picture of all time. DeGeneres, who appeared to be aiming for chummy celebrity camaraderie instead of actual jokes, asked Meryl Streep, Julia Roberts and other superstar nominees to join her in a selfie and — while it might have started off as a gag — the idea gained immediate momentum with actors excitedly jumping into the frame. Brad Pitt, Angelina Jolie, Jared Leto, Bradley Cooper, Lupita Nyong’o and Kevin Spacey all joined the fray, and as of lastcount, the picture has been retweeted well over 2 million times. 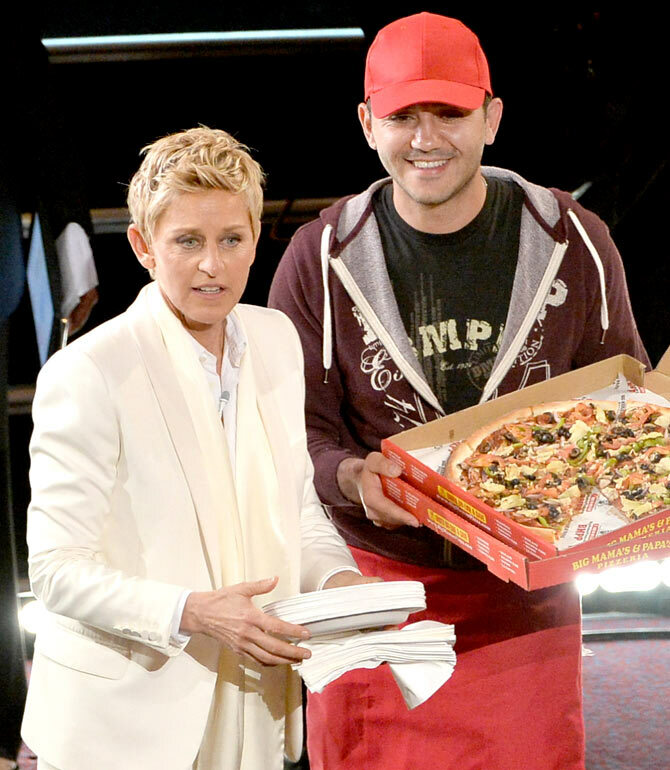 Ellen’s other truly effective bit started off sounding like a tired schtick about how all the actors in the auditorium are hungry. She asked who all were hungry and promised to call for pizza, and it didn’t really get — or deserve — a big laugh. 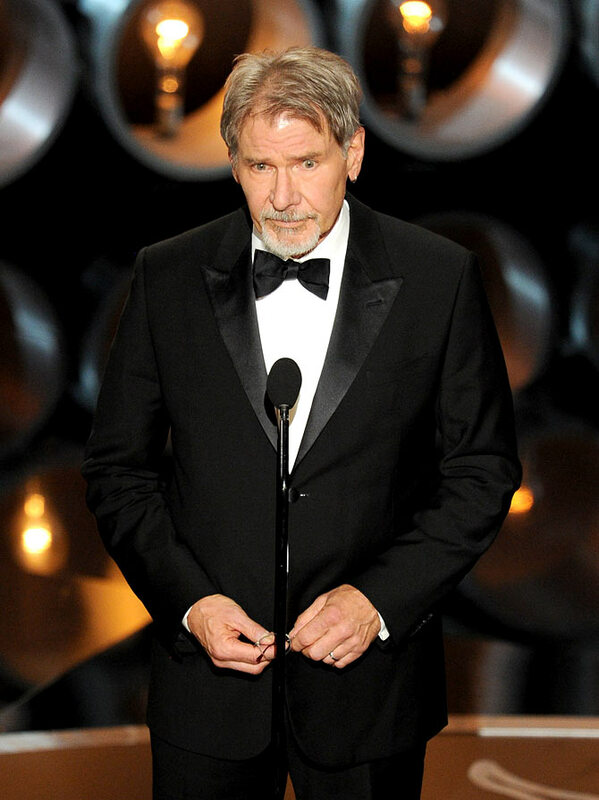 It’s always fun when a legendary star strides onto the stage while the orchestra strikes up a larger-than-life theme tune that transcends the ages, and it was thus that we felt enthused to see the one and only Harrison Ford walk out to the Indiana Jones theme. However, Ford, now 71, was given perhaps too long a monologue, or maybe he just forgot his glasses at home and was straining to read the teleprompter. Either way, having to introduce three Best Picture nominees was a bit much, and Ford droned on without pause or impact or, indeed, any oratory skill whatsoever. It was the worst kind of deadpan, and embarrassing to watch. "Don’t patronise me," Carrey grinned as he walked out to an applauding audience. 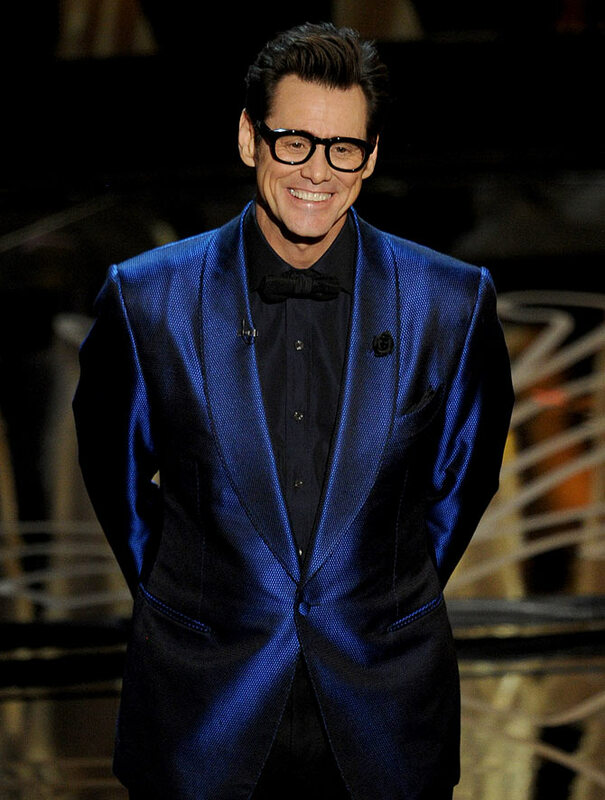 Ever articulate and quite the charmer on stage, Carrey seemed in uncharacteristically provocative mood for the Academy Awards. Wearing an incredibly blue suit, the actor singled out veteran Bruce Dern as one of his heroes, and said he was thrilled for Dern. He then proceeded to do a spot-on impression of the 77-year-old actor, using his rubberface to unnerving effect. 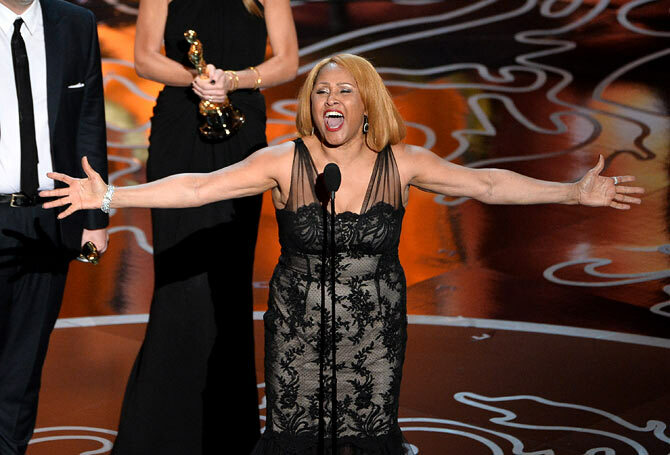 Musical performances are scarce at the Oscars (which is a blessing to all those exhausted by the ceremony’s length) but among the best speeches of the night was famed singer Darlene Love, who decided randomly to burst into song. It went on longer than the Oscar producers could have planned and, even as Love wrapped up the song, an ebullient Bill Murray leapt to his feet. 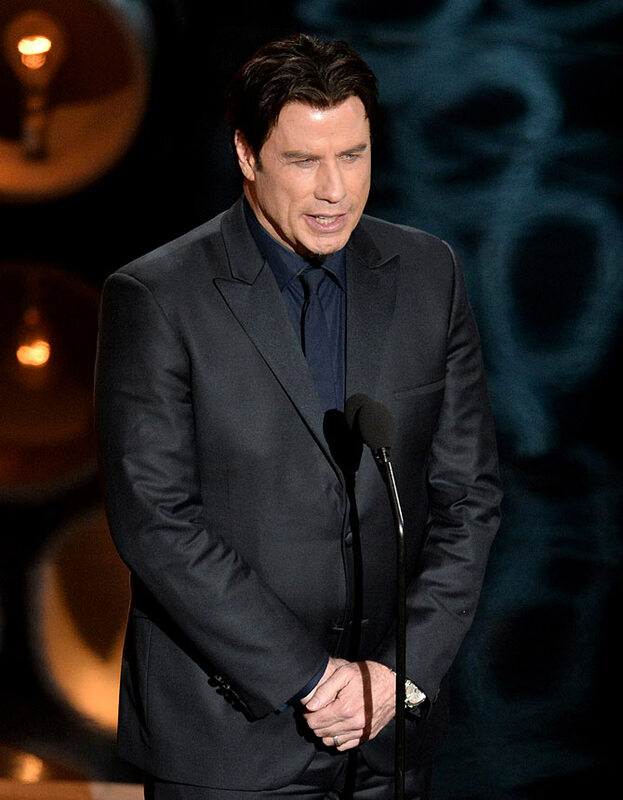 The gesture swept up the rest of the A-list crowd and soon Love had a full-fledged standing ovation. What a moment. 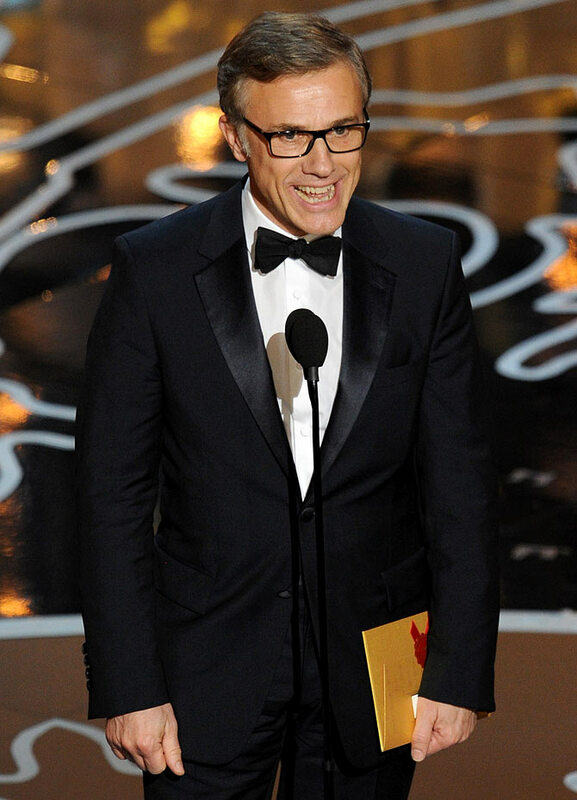 Christoph Waltz has dominated the Best Supporting Actor category the last few years, winning the award for Quentin Tarantino movies Inglourious Basterds a couple of years ago and Django Unchained last year. However, it felt utterly surreal to see him on stage this time thanks to the music playing. The orchestra struck up a good ol’ Louis Armstrong number, A Kiss To Build A Dream On, but — thanks to Bollywood’s liberal plagiarising — it’s hard not to think instead of the tune we heard more of, and more recently: Shantanu Moitra’s Kaisi Paheli Zindagani. And watching Hans Landa, the scariest jew-hunting nazi of the screen, walking out to a theme from Parineeta felt well and truly odd. Leonardo DiCaprio, Jared Leto: Oscar night with mum! 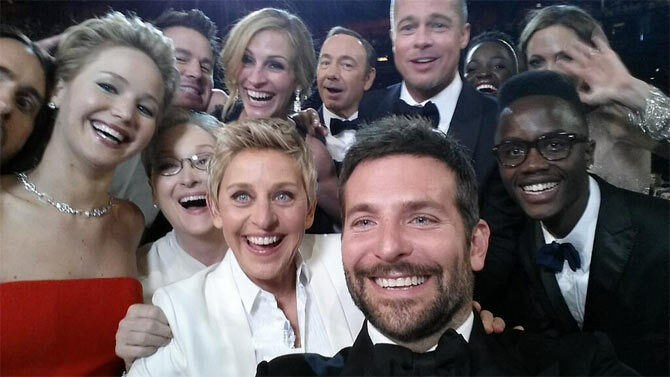 The Oscar selfie that brought Twitter down!